Today I found out that the moon isn’t as old as the Earth and was formed approximately 30–50 million years after the Solar System based on what is called ‘the giant impact theory’. Although no one can say for sure exactly how our moon came to be, there a few hypothesis and theories of which the ‘the giant impact theory’ is the most compelling and widely accepted. 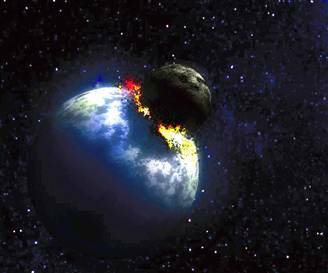 In this theory, the Earth had no moon until it was struck by a rogue planet which instantly vaporized. The impact is said to have created a cloud that reached roughly 13,700 miles or 22,000 kilometers high, where it condensed into solid particles that orbited the Earth. Over time they aggregated into larger moonlets, which eventually combined to form the moon we know today. This theory is supported by quite a bit of evidence such as: even though the Earth has a large iron core and the moon does not, the moon has exactly the same oxygen isotope composition as the Earth, unlike other planets formed in other parts of the Solar System. This indicates the moon should have been formed from material in Earth’s neighborhood. Another significant piece of evidence comes from the oldest record of Earth’s ocean tides ever found, which were 3.2-billion-year-old rocks from South Africa. Pinstriped circular sand-and-silt layers in the rocks were deposited by daily, fortnightly and monthly tidal cycles. If the moon formed elsewhere, then was captured intact by Earth’s gravity as some theories state, the moon’s orbit would have been extremely elliptical and tidal rock layers would not have shown such normal cycles. Computer simulations modeling a giant impact are consistent with measurements of the angular momentum of the Earth–Moon system, and the small size of the lunar core. They also show that most of the Moon came from the impactor planet and not from Earth. The post-impact mixing of the vaporized material between the forming Earth and Moon could have equalized their isotopic compositions, but this again is just speculation. The rotation of the moon (i.e- the time it takes to spin once around on its own axis) takes the same amount of time as the moon takes to complete one orbit of the Earth, about 27.3 days. This means the moon’s rotation is synchronized in a way that causes the moon to show the same face to the Earth at all times. One hemisphere always faces us, while the other always faces away. The lunar far side (aka the dark side) has been photographed only from spacecraft. The South African rocks indicating tidal patterns indicate that 3.2 billion years ago, the moon orbited Earth in perhaps a 20-day month and was 25-percent closer to Earth than it is today. At that time, the Earth would have spun faster, so there would have been about 550 days in a year. Temperature on the moon’s surface is said to range from 243 degrees Fahrenheit (117 degrees Celsius) for two weeks at a time (the lunar day lasts about a month), then, for an equal period, the same spot is in the dark and cools to about -272 degrees Fahrenheit (-169 degrees Celsius). The saying ‘once in a blue moon ‘ refers to the occurrence of two full moons during one calendar month. The Moon is bigger than Pluto. And at roughly one-fourth the diameter of Earth, some scientists think the Moon is more like a planet. They refer to the Earth-Moon system as a “double planet.” Pluto and its moon Charon are also called a double-planet system by some. Bye-Bye Moon. The Moon is actually moving away from us. Each year, the Moon steals some of Earth’s rotational energy, and uses it to propel itself about 3.8 centimeters higher in its orbit. Researchers say that when it was formed, the Moon was about 14,000 miles (22,530 kilometers) from Earth. It’s now more than 280,000 miles, or 450,000 kilometers away. @ Desirae – Which would mean one month would have two full moons. FTFA – The saying ‘once in a blue moon ‘ refers to the occurrence of two full moons during one calendar month. second step of creation, when earth became able for revolve around the sun after collecting the huge amount of mass. sorry for not exclusively define. cuz this is my personal research. @jumani: I assume you’re referring to text in Genesis. Tell me, where in Genesis does it describe how the moon was formed? I’ve personally read it many times and have never seen it mentioned. Certainly it provides a loose “when” here: “And God made the two great lights: the greater light to rule the day, and the lesser light to rule the night” but not a “how”. Further, Genesis refers to “events” (the original Hebrew wording more accurately translates to “events”, rather than “days” as is often stated in English translations; events obviously makes a lot more sense in terms of how an eternal being would think, rather than thinking in terms of rotations of a planet that doesn’t yet exist), so how long these events would have taken and what the details were in their doing is completely unknown in terms of what is stated in the Bible. Thus, we must look at the evidence at hand to answer the “how” question, whether you believe it was done by divine intervention or not. The evidence at hand does not contradict the Bible in this matter, simply gives details that aren’t mentioned in Genesis. So there is no conflict here in terms of “science vs. religion”. seriously, I have find out that how moon was farmed. and you all have a clue, that, earth will had been revolve just a one time around the sun without moon. i am sorry again for does not well define due to my personal discovery. the moon was brought here, oh and its hollow. the moon sends negative waves that our brain picks up which creates bad actions on our part(crime rates higher on full moons) When we landed on the moon it rang like a bell for hours. Do some research instead of just being told and you’ll find some amazing things on this planet that are hidden from our eyes.